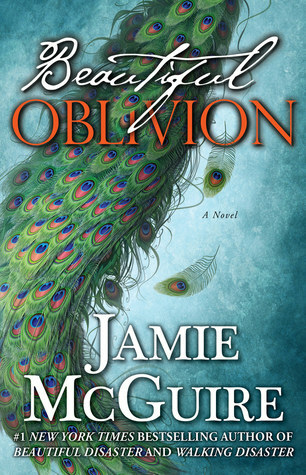 Beautiful Oblivion is the first book in the Maddox Brothers series by Jamie McGuire, a series that follows the story of Travis Maddox's brother finding the person they're meant to be with, in case you don't know (shame on you ;)). Travis Maddox is the male lead in Beautiful Disaster/Walking Disaster which tells the story of him and Abby Abernathy falling in love and fixing each other. Travis has numerous brothers who are getting their stories told one by one. Beautiful Oblivion concentrates on Travis' younger brother, Trenton, a tattoo artist with a broken past and his relationship with Cami, a girl from a family of brothers who is always to blame in her father's eyes for all that goes wrong. Trenton and Cami meet when Cami is out one night with friends, they've always been around each other as they went to the same schools but as far as Cami is concerned Trenton has never looked twice at her. Oh how wrong she is. Trenton has been in love with her since he was a kid, always watching her from afar and we all know these Maddox boys fall in love hard and for life. Trent is all for pursuing Cami and having a relationship with her, but she has other ideas as she is in a relationship with TJ, her boyfriend who lives in California and she doesn't see all that often and works crazy hours. Slowly Trenton manages to make Cami open up to him and they become friends which quickly develops into much more. Before it began to develop I could have killed these two, always dancing around each other when it was clear to everyone but them that they were supposed to be an item. I loved their scenes together when they were getting to know each other. They instantly got on and you could just see that they were made for each other. I loved seeing that and seeing them realise they were far more than friends. It isn't until Trent finally makes a move that things start to sort themselves in a weird kind of way. Shortly after the moment with Trent Cami decides to be honest and tell TJ that what happened and his response was to book her on a flight to Cali. Trent tries to stop her, but she leaves anyway which kind of annoyed me. She already knew that things weren't working and that Trent was there and willing to be with her and that moment she walked away? You could just imagine how much Trent's heart was breaking. When Cami returns after going to see TJ with things over between them there's a huge gap between her and Trent and I was praying that they could fix it. I wanted them to get everything figured and sorted and be together. There is a HUGE twist at the end. The whole way through the book Cami is saying that she has a secret that would destroy her and Trent's relationship and I was just screaming all the time: WHAT IS IT! I made a few guesses, but none were right. And then we find out and boy is it a good one! My jaw dropped when I found out and couldn't believe what I was reading and I really hadn't seen it coming. I also loved seeing certain scenes that were in Beautiful Disaster/Beautiful Oblivion from a new pair of eyes and getting the blanks filled in. Occasionally we come across the supporting characters in the two original books and that was great too. One thing I will say about this book is that I didn't find Trent/Cami's story as intense or gripping as Travis/Abby's. The raw and primal need wasn't there for me in this one and it took me a lot longer to get into than it did with Beautiful Disaster/Walking Disaster. All in all, this is a great book to add to your to read list but if you haven't read Beautiful Disaster/Walking Disaster yet I'd recommend reading that first before moving onto this series.